Diagnosis is the process of identifying a disease or disorder in a person by examining the person and studying the results of medical tests. The process of diagnosis begins when a patient appears before a doctor with a set of symptoms, such as pain, nausea, fever, or some other unusual feeling. In many cases, the diagnosis is relatively simple. The physician can decide by making a few simple observations as to the patient's problem and can prescribe a proper treatment. At other times, the symptoms may be more difficult to interpret, and making a diagnosis may require laboratory tests and other kinds of examinations. In order to make a diagnosis, a physician searches for information from three major sources: the patient himself or herself, a physical examination, and a laboratory examination. Patient information. Patient information is obtained by asking the patient a variety of questions about his or her previous health history and present symptoms. For example, the patient who is experiencing unusual pains may be asked to tell how long the pains have persisted, where they are located, the type of pain experienced, and whether the pain is constant or intermittent. Biopsy: The removal and examination of tissue from a person's body. Invasive: A technique that involves entering the body. Laparoscope: A device consisting of a long flexible tube that contains a light source that allows a physician to look into the abdominal cavity without making a large incision in the abdominal wall. Laparotomy: A process by which the abdominal wall is opened in order to allow a physician to look inside. Palpation: A technique used by doctors that involves the use of fingers to touch and feel various parts of a patient's body. Stethoscope: A device that magnifies sounds produced in the human body. A patient's occupation may have a bearing on his or her illness. Perhaps he or she works around chemicals that may cause illness. A job that requires repeated bending and lifting may result in muscle strain or back pain. A police officer or fire fighter may have periods of boredom interrupted by periods of stress or fear. The medical history of a patient's family may also be helpful. Some diseases are hereditary and some, although not hereditary, are more likely to occur if the patient's parent or other close relative has had such a disease. For example, the person whose father has had a heart attack is more likely to have a heart attack than is a person whose family has been free of heart disease. Personal habits, such as smoking or drinking large amounts of alcohol, also contribute to disease. Lack of exercise, lack of sleep, and an unhealthy diet are all involved in bringing about symptoms of disease. The physical examination. In addition to exploring the patient's clinical history, the physician will carry out a physical examination to further narrow the list of possible medical problems. The patient's temperature, blood pressure, and rate of respiration will be measured. He or she will be weighed and his or her height measured. The physician will examine the eardrums and look into the throat for signs of inflammation, infection, or other abnormal conditions. 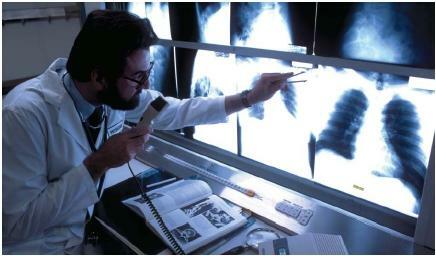 The heart and lungs can be examined superficially (from outside the body) using a stethoscope. A stethoscope allows the physician to hear abnormalities in the heartbeat or in the functioning of the heart valves. The presence of water or other fluid in the lungs can also be heard with a stethoscope. The physician can also study sounds made by the intestines by listening to them through the stethoscope. A physician may also use a technique called palpation, in which the physician uses his or her fingers to probe the abdomen for signs of pain or an abnormal lump or growth. The doctor also feels the neck, the area under the armpit, and other areas to locate any enlarged lymph nodes, a sign of an infection. Such probing also may bring to light the presence of a tender area previously unknown to the patient. If the patient is complaining of an injury, the physician can carefully palpate around the injury to determine its size. He or she can bend a leg or arm to determine whether a joint has been broken. Similar techniques also reveal whether a ligament (tissue that connects bones) has been torn and if it may need surgical correction. The laboratory examination. The physician also may decide to have laboratory tests performed on various fluids taken from the patient. The most common fluids used are blood, urine, stomach fluid, and spinal fluid. As an example, tests of the blood reveal the number of white and red blood cells. An elevated number of white blood cells indicates an infection is present, but does not pinpoint the location of the infection. Blood also carries hormones and other components that are directly affected by disease or inflammation. The modern clinical laboratory is one of automation and high technology. At one time, a laboratory technician was required to mix together the chemicals needed for each clinical test. Newer technology requires only that a blood specimen be placed in one end of a machine. The blood is carried through the machine, where minute amounts of the chemicals are added as needed, and test results are printed out automatically. This technology also enables the measurement of blood or urine components in amounts much smaller than previous technology allowed. In some cases, a single microgram (one-millionth of a gram) can be detected in blood, urine or some other fluid. tumors. Magnetic resonance imaging (MRI) uses radio waves in a magnetic field to generate images of a layer of the brain, heart, or other organ. Ultrasound waves are also sometimes used to detect tumors. Other laboratory specimens can be obtained by invasive techniques. An invasive technique is one in which a physician cuts open the body to look directly inside it for possible medical problems. For example, a physician who finds a suspicious lump or swelling can remove part of the lump and send it to the laboratory to be examined. The surgical removal of tissue for testing is called a biopsy. In the laboratory, the specimen is sliced very thinly, dyed to highlight differences in tissues, and examined under the microscope. This procedure enables the physician to determine whether the lump is malignant (cancerous) or benign (noncancerous). The method of actually looking into the body cavity used to consist of a major surgical procedure called a laparotomy. In that procedure, an incision is made in the abdomen so the physician can look at each organ and other internal structures in order to determine the presence of disease or a parasite. Today, the laparotomy is carried out using a flexible tube called a laparoscope. The laparoscope is inserted into the body through a small incision. It is attached to a television monitor that gives the physician an enlarged view of the inside of the body. The flexibility of the laparoscope allows the instrument to be guided around the organs. A light attached to the scope helps the physician see each organ. The laparoscope is also equipped with a tiny device to collect specimens or to suction blood out of the abdomen. I've been using this information for my research, and trust me, it has done a great deal for me. It has helped me so much. Thank you.